Forward Maro Itoje will recover from a fractured jaw in time to be fit for the start of England's Six Nations title defence against Italy on 4 February. 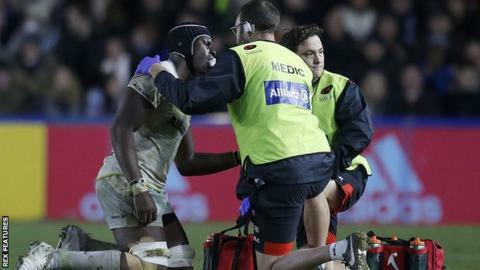 Itoje, 23, had two plates inserted in his face after sustaining the injury in a defeat by Harlequins on 3 December. But Saracens say Itoje faces a maximum of four more weeks in rehabilitation after visiting a specialist. "Maro is probably three or four weeks away," said Saracens' director of rugby Mark McCall. "He went to see the specialist who said a maximum of six weeks and he's already done a week and a half." British and Irish Lion Itoje departed in the 48th minute of Saracens' 20-19 defeat at Twickenham Stoop following a collision with England team-mate Mike Brown. He could also return for the final two rounds of Saracens' Champions Cup group campaign against the Ospreys and Northampton in January. Itoje, who has 14 caps, started every match as Eddie Jones' England side won the 2017 title, but only featured in two autumn Tests as his playing time was managed.